Watercolor paper is a general term for any exclusive paper used in drawings that employ water-based paints such as transparent or non-transparent watercolors. Because the expressions of watercolor paintings are created by the manner in which the water, the paint, the base (e.g., paper), and other materials interact with one another, the paper’s particularities and conditions (its water absorbability, paper texture (kamihada), surface unevenness, color development, durability, and storage stability, etc.) are extremely important. Water absorbability is the amount of water that seeps into the paper. This quality exerts a heavy influence on the unique effects produced by watercolor paints, including the effects of running (nijimi) and blurring (bokashi). Paper thickness, fiber density, and “sizing” measures designed to stop running have a significant impact on absorbability. With regard to paper texture, depending on the size and depth of the unevenness on the page space, you can create various painterly effects: you may apply coloring only to the convex parts, make subtle changes in tone from the differences in paint amounts that accumulate on the concave portions, and for a smooth surface you may print smoothly and evenly. Paper with substantial unevenness allows for more moisture, and the paint tends to accumulate easily on the paper space without streaming down. Color development is another important trait. The shading (iromi), basic ingredients, and contents of the paper itself have a great deal to do with color development, but the effects caused by the aforementioned “sizing” and paper texture are also relevant. When there is strong “sizing” and large unevenness on the page space, the color development will improve. Other conditions of watercolor paper include durability (the paper’s ability to prevent roughness, fluffing, wrinkling, and warping against the effects of over-painting) and acidity (neutral acidity helps the paper withstand deterioration). 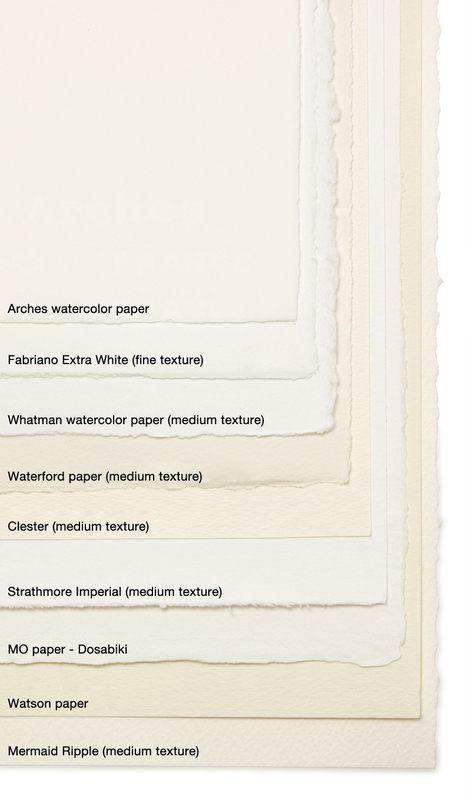 Watercolor paper is chiefly made from the basic ingredients of cotton, wood, and flax. As for current methods of Japanese paper making (shōshi), hand-made (te-suki) paper is hard to come by, while machine-made (kikai-suki) paper represents the majority. However, there is also a manufacturing method for paper-making that can produce a texture that resembles that of hand-made paper: the half-machine-made (han-kikaisuki) method known as “mold-made.” Hence, 100% cotton watercolor papers made using this “mold-made” method are considered high-quality merchandise. Some representative examples of watercolor paper include Arches Watercolor Paper (made in France), Fabriano Watercolor Paper (made in Italy), Whatman (made in England), Waterford (made in England), MO paper (hand-made in Japan), Watson paper (made in Japan), and Mermaid (made in Japan). The manufacturers of these papers also produce watercolor paper with various other features. When painting with high levels of moisture, you should use relatively thick paper, or draw only after you have stretched on the panel in advance. Moreover, when using paper that has been heavily affected by the procedure of “sizing,” you can adjust the water absorbability by drying the paper after repeatedly “draping” (mizubiki) its surface with a water-damp brush or similar object. Various types of watercolor paper are available for purchase at general art supply stores.